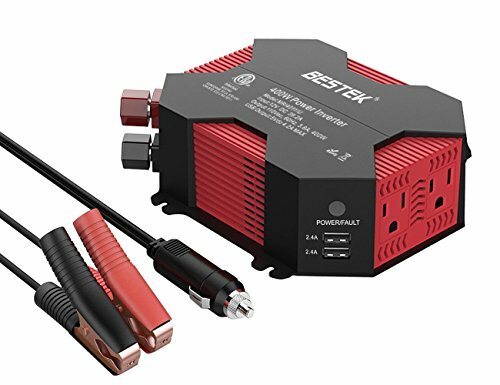 ➤♛BESTEK :America's Leading Power Inverter Brand,enjoying a reputation of "Best Sellers " in power inverters! BESTEK is devoted to providing portable power inverters of the highest quality and performance for powering up multiple loads and major household appliances! ✔Safety Upgraded: The grounding wire *2 support! Against electric shock. ✔Battery Clamps: Pure copper-made clamps, 125% conductivity. Real full power! -Built-in replaceable 40A fuses & Ultra silent cooling fan . -⚠Please do not expose the inverter in wet, high temperature, high voltage environment. -⚠Make sure the input voltage and use power range of your device are not larger than the inverter's rated output voltage and power. -⚠Tighten the Positive (+) and Negative (-) terminals when the inverter is in use otherwise a loose connection can overheat due to poor contact.